Can you say "cleaning house"? Gone are last year's defensive coordinator, QB/WR coach, FB/LB coach, secondary coach and equipment manager. You almost get the idea that Doug Kay wasn't very happy with his 2000 coaching staff. If that's the case -- and signs would seem to point to it being the case -- Kay was well within his rights to be a little upset. 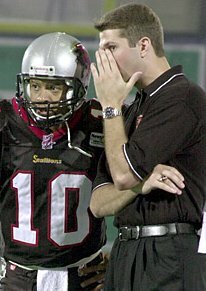 Playcalling cost the Cobras several games in 2000, which hurts even more acutely when you finish only a game or two out of the playoffs. Whoever was responsible for hiring this year's version of the Cobras coaching staff deserves kudos on several fronts. On offense, Gerald Carr, last year's QB and WR coach, had coaching experience both at the college level and in the NFL. Unfortunately, he was coaching in the AFL, and his inexperience with the Arena game often showed. As head coach with the Augusta Stallions in 2000, Mike Neu was named af2 Coach of the Year after leading the Stallions to a 14-4 record and within one game of the ArenaCup. And before that, he served as quarterback coach and offensive coordinator for the Nashville Kats; he also has AFL playing experience at QB on his resume. This means, in other words, that Kay, a defensively-minded coach, will have an experienced AFL hand calling the offensive plays and working with Fred McNair and company. That fact alone should give the Cobras at least one more win this season. On defense, Lee Johnson was cut loose as coordinator after a year in which that half of the Cobras' game was hardly spectacular. Johnson had defensive coordinator experience in the CFL and playing experience in the NFL, CFL and AFL, but his replacement has even stronger credentials. Since Kay did not hire a coach to fill Johson's job, it's clear that Kay himself wants more personal control over the defense, which should be for the better. Kay has been the defensive coordinator on two ArenaBowl champions (Tampa Bay in 1993 and Arizona in 1997), and has, in all, six years of experience in that coaching capacity. As long as his attention isn't too distracted from the team as a whole, this move will have good results. Finally, tackling Houston's other role, strength coach, will be... drum roll please... CZ Forum regular Chris Hendley. He will obviously have a huge impact on the team's success, for, finally, the combined wisdom of CobraZone readers will be heard by the coaching staff -- well, by at least one member anyway. Seriously, best of luck to Chris. The 2001 Cobras coaches seem to have something for everyone: a nod to AFL experience, a nod to Cobras players, a nod to local connections and a nod to us, CobraZone. Now, they'll need to put it all together into a big something for the fans -- a winning team. af2 Coach of the Year Mike Neu (seen here with Aaron Sparrow of the Augusta Stallions) joins the staff as Offensive Coordinator. Discuss the Cobras' coaching staff in the Rating the Roster thread of the CZ Forum.